Please visit our Freeport location on Wednesday, April 17th at 1PM to get meet John Connolly and get a signed copy of his book Dying Out Here is Not an Option. 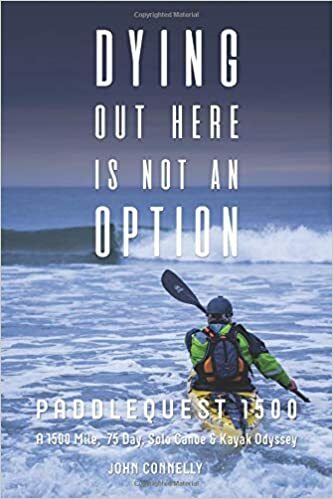 This book details his solo journey as he became the first to both canoe the Northern Forest Canoe Trail and kayak the Maine Island Trail, but went a step further connecting them with the Saint John River and Bay of Fundy in New Brunswick, Canada which meant traveling 1500 miles in 75 days. This is an extraordinary feat, so come and meet John and get inspired to have your own outdoor adventures! To learn more about John Connolly visit his website. John Connolly was a leader of L.L.Bean’s Outdoor Discovery School for 10 years and a former member of the US Canoe & Kayak team with numerous whitewater first-descents to my credit. He was inspired to take this journey after reading many reports of how Americans spend more and more of their lives inside and in front of a screen, and wishes to raise awareness of the physical and mental health benefits that come from communing with nature.